August 6, 2013 By Allyson 33 Comments This post may contain affiliate links. Read my disclosure policy. I didn’t want to feel too guilty eating these little mini pies, so I skinnied them up (well, as skinny as you can make a pie, come on! ), and made them into individual servings so I couldn’t serve myself half a pie. They turned out great, I didn’t notice anything different with the taste of the skinny version compared to the regular full fat version. Honestly, ‘I’m not going to be calling them healthy, but it’s worth a splurge once in a while. 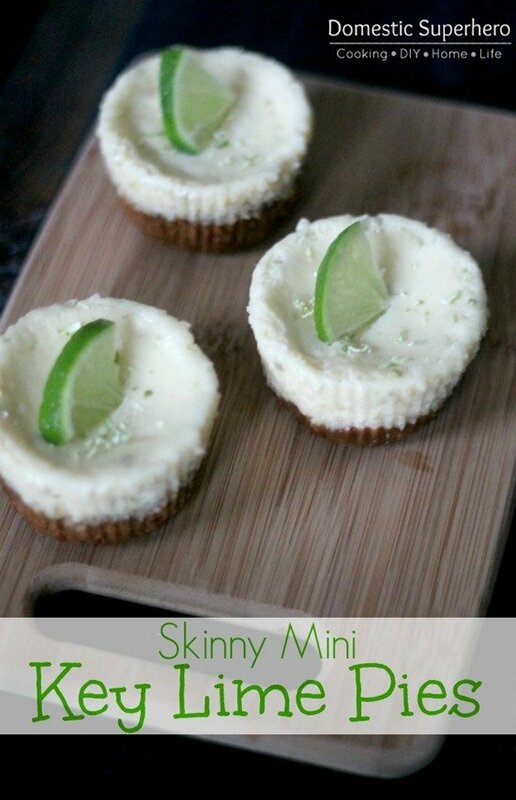 These Skinny Mini Key Lime Pies are the perfect summer treat! These were soooo easy to make! Pretty fast, minimal ingredients, inexpensive, and so tasty! 1. Preheat the oven to 350º. 2. In a small bowl mix graham cracker crumbs, sugar, melted butter, and 1 tsp. lime zest. Mix until completely combined. 3. Place cupcake liners in cupcake tins. 4. 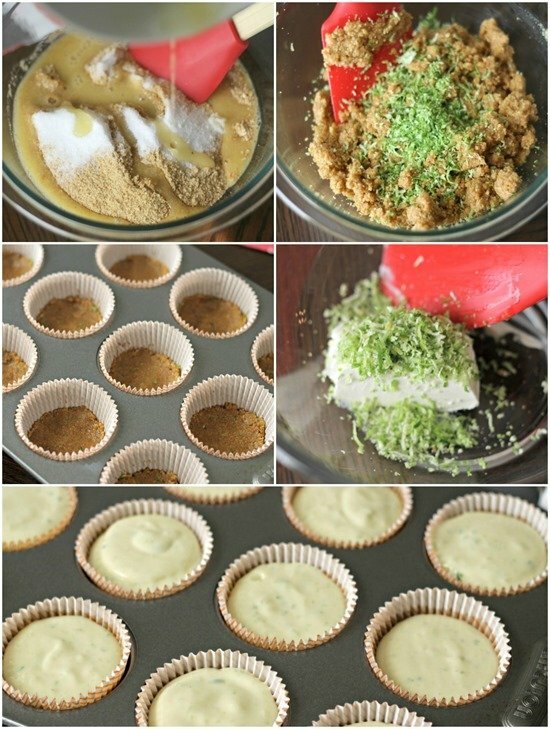 Add 2 TBS of the graham cracker mixture and press down in each cupcake liner. 5. Bake for 8 minutes, remove from oven, and let completely cool. 6. With a stand or hand mixer combine softened cream cheese, salt, and lime zest. Mix until combined. 7. Add low fat sweetened condensed milk and mix until incorporated and no lumps of cream cheese remain. 8. Mix in egg yolk and key lime juice until incorporated. 9. Pour mixture into cooled graham cracker cupcake liners 3/4 of the way full. 10. Bake for 15 minutes at 350º. 11. Remove from oven and place in refrigerator for at least 1 hour. 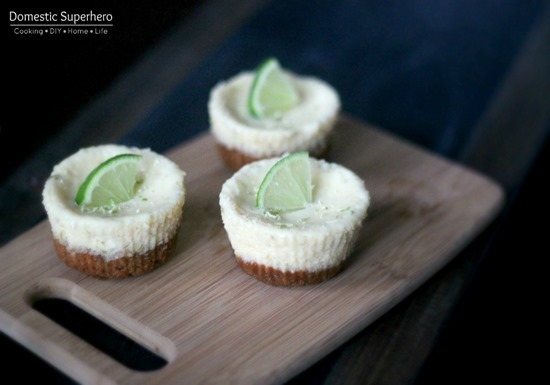 Top with fresh lime zest and lime garnish if desired. Serve. This recipe yielded 12 mini pies for me, however depending on how much graham cracker mixture you put into the tins, you could make more or less. I did have a bit of extra filling, so if you go ahead and use 2 cups of graham cracker crumbs, you could probably yield 15 mini pies! Want more? Head over and like Domestic Superhero on Facebook! How cute! I love the idea of single servings and they look delicious! These are so adorable and look delicious! I love that they come portion controlled already! THank you, Catherine! It is definitely hard to eat only one…but maybe 2 isn’t so bad 😉 Thanks for coming by! I love key lime pie! I try to avoid sweets, too, because I know it’s all too easy to get carried away, but these little guys are perfect! So cute and delicious! And key lime is one of my favorite summer flavors. Pinning to my dessert board. Thanks for sharing at All Things Pretty. Thanks for coming by, Kathy! Thank you, Nicky! I too, obviously love Key Lime! These little bad boys are so delicious, I hope you try them! I visited your party and got all linked up! THanks for the invite! I just checked out those pancakes and THOSE looks delicious! Definitely pinning and trying! Thanks for stopping by! Thanks, Megan! They are very tasty! Thanks for stopping by! Delicious looking!! We are going on a picnic this weekend and I’m going to make some for a portable dessert. Thanks so much for sharing this recipe!!! Glad I found your blog, too! 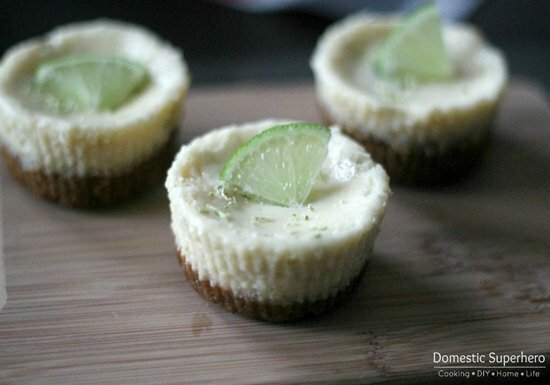 Thanks so much for sharing your Key Lime Pies at the Pin Junkie Link Party! They were featured this week. I hope you’ll stop by to grab a button! Let me know how they like it!! Thanks for coming by! Thanks, Heather! I gave y’all a big shout out on Facebook! I baked these this past weekend, subbing half of the butter for non-fat Greek yogurt (only 188 cals per cupcake) and OMG they are AMAZING! My boyfriend and his friends said they tasted straight from a bakery. Thanks for sharing your recipe — can’t wait to make them again! Wow, what a great substitute! I love using greek yogurt in place of things but this one totally slipped my mind! Talk about a skinny treat, right? I am so happy you liked them! We love them over here, too! These look amazing but how in the world are they skinny? Just because they are small? LOL! Well, yes, they are smaller, but also they have reduced fat neufchatel cream cheese, which is 1/3 less fat than regular cream cheese, and also low fat condensed milk. They are small changes, but every calorie counts, right? Hope you love them as much as we do!